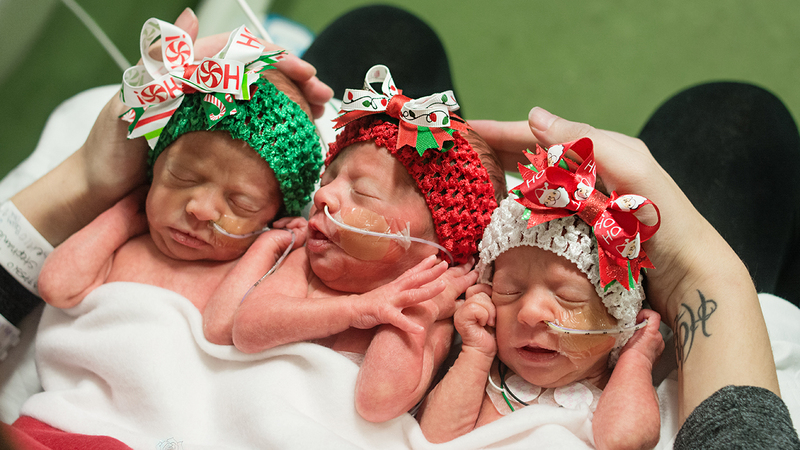 HOUSTON -- Little Addison, Kinsley and Savannah Harris were born on December 1, but their family is celebrating the health of the identical female triplets this Christmas. "After all we've been through the past eight months, to have three healthy babies, we feel extremely blessed," says Stephanie Harris. "This Christmas is extra special for us and one we'll always remember." The odds of having identical female triplets can range from one in 60,000 to one in two million, the hospital noted. The girls were delivered via cesarean section and have since been in the Neonatal Intensive Care Unit at the hospital. The hospital points out the care is routine, consistent with the birth of multiples. "The girls are all getting stronger by the day and they are right on schedule with where we would expect them to be at this point," says Dr. Rene Ramirez, neonatologist, medical director, NICU, Memorial Hermann Southeast. "I see no reason why they won't be heading home with mom and dad in just a few more weeks. They're all three doing very, very well." The three girls all weighed between three and three-and-a-half pounds at birth. Brad Harris said, "I'm so happy they're here, having three healthy girls is the best Christmas gift we could have been given. I'm really looking forward to having the girls home and our family all together very soon."